Background: Hypothyroidism affects around 1% of general population. Anemia in association with hypothyroidism has been studied since 1881. Iron deficiency has multiple adverse affects on thyroid metabolism. It decreases circulating thyroid hormone concentration, blunts thyrotropic response to thyrotropin-releasing hormone (TRH) and decreases serum triiodothyronine (T3). Objectives: To find the prevalence of iron deficiency in primary hypothyroids. 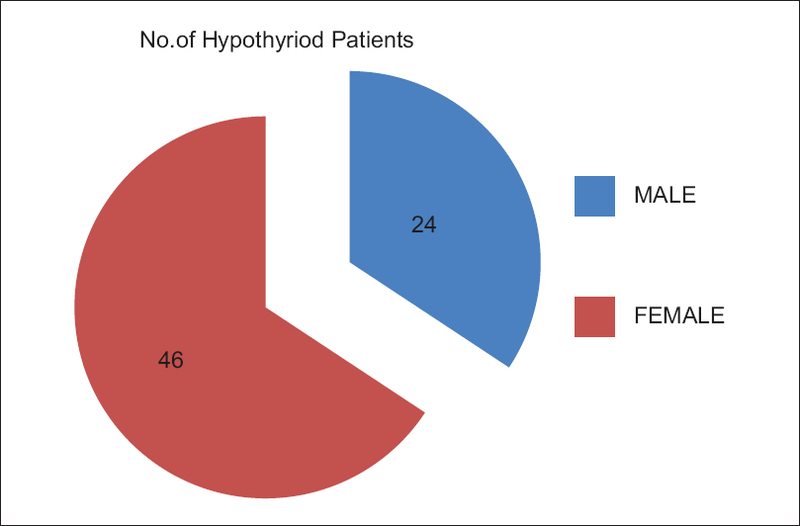 Material and Methods: In our study, 70 patients were selected, out of which 50 were females and 20 were males, who were suffering from hypothyroidism. Iron deficiency in the study group was confirmed at baseline using multiple iron status indicators (serum ferritin, serum iron, total iron-binding capacity and percentage saturation). These patients were between age group 18–65 years. Results: In our study, only 14 patients (20%) manifested with anemia (which was defined as HB < 12 gm/dl), whereas the prevalence of iron deficiency (with or without anemia) was 34.2%), in which 28.5% were females and 5.70% were males, thus showing that prevalence of iron deficiency (with or without anemia) can be higher than iron deficiency anemia itself, which is supported by literature. Conclusion: Iron deficiency was present in a significant portion of patients with primary hypothyroidism. It also concluded that frequency of iron deficiency (with or without anemia) was higher than iron-deficiency anemia. Reduced production of thyroid hormone is central feature of the clinical state termed as hypothyroidism. Hypothyroidism is common, affecting 1% of general population and about 5% of individuals over age 60 years. Primary hypothyroidism is the etiology in approximately 99% cases of hypothyroidism, with less than 1% due to thyroid stimulating hormone (TSH) deficiency or other causes. Single best screening test for hypothyroidism is serum TSH, which is increased in primary hypothyroidism but is low or low normal with pituitary insufficiency, the free thyroxine (FT4) may be low or low–normal. Hypothyroidism can affect all organ systems, and these manifestations are largely independent of all underlying disorders but are a function of the degree of hormone deficiency. Metabolic abnormalities associated with hypothyriod include dilution hyponatremia and anemia. Anemia may occur before any other manifestation of thyroid disease appears. An important observation is that anemia in hypothyroidism is often not diagnosed because hypothyroids have a lower volume of plasma, which causes a false high estimation of hemoglobin in blood. Three major types of anemia are usually considered: Normochromic normocytic, hypochromic microcytic and macrocytic. There is hypoplasia of all myeloid cell lines in hypothyroidism and all hematological parameters return to normal when an euthyroid state is achieved. Macrocytic anemia is caused by malabsorption of vitamin B12, folic acid, pernicious anemia and inadequate nutrition. Normocytic anemia arises due to thyroid hormone deficit and not by nutritive deficit. Microcytic anemia is usually ascribed to malabsorption of iron and menorrahagia. In hypothyroidism, iron malabsorption occurs secondary to achlorhydia. Previously published studies suggested that there is a relationship between hypothyriodism and low iron, B12, and folic levels. A growing number studies have demonstrated direct role of thyroid hormone in human erythropoiesis and in increased production of erythropoietin. Iron-deficiency anemia coexisting with primary hypothyroidism results in a hyper adrenergic state. If both iron and ferritin are low, taking thyroid hormone, especially any with triiodothyronine (T3), will cause intolerable anxiety, and again one will return to their previous lower dose. Correction of iron deficiency in patients intolerant to thyroxine sodium therapy may result in tolerance to this agent. To study the prevalence of incipient iron deficiency in primary hypothyriod patients. The patients were recruited for study from emergency ward, indoor wards of General Medicine and outdoor patients. Patients of all age groups and either gender who present with clinical suspicion of hypothyroidism or already diagnosed were included in the study and were evaluated for iron deficiency over a period of one year. Patients with primary hypothyroidism (newly diagnosed or previously on treatment). Anemia in subclinical hypothyroid patients. All the participants who were included in the study were explained the purpose of the study and written consent was obtained from them. A detailed history was taken, and a physical examination was done. A detailed nutritional history and drug history (especially aspirin or nonsteroidal anti-inflammatory drug (NSAID) intake was taken to rule out any nutritional cause for iron deficiency, or occult gastrointestinal (GI) blood loss or prolonged intake of proton-pump inhibitors (which may cause hypochlorhydria/achlorhydria) was taken. Baseline investigations including liver and renal function test were done. Serum B12 and folic acid levels were measured. All patients had peripheral blood smear examination, including a stool examination for ova or parasites, and for occult blood. Colonoscopy, upper gastrointestinal (UGI) endoscopy, ultrasonography (USG) abdomen, gynecological and genitourinary examinations were performed as necessary at the appropriate departments. In specific iron profile and bone marrow examination in certain cases where ever required was done. Patients with iron deficiency defined as serum ferritin <15 μg/l, TIBC > 360 μg/dl, %saturation < 15% and serum iron <30 μg/dl. Primary hypothyroidism defined as TSH > 4.0 μIU/ml (0.4–4.0) and free thyroxine (FT4) levels < 0.89 ng/dl (0.89–1.76 ng/dl), according to laboratory values in hospital. Total number of patients included in study was 70 [Figure 1]. 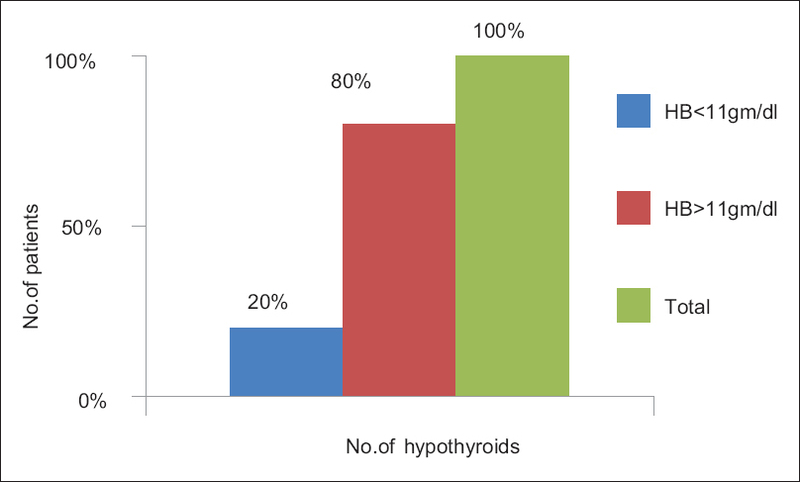 Prevalence of hypothyroidism was higher in females. In our study, we found that the prevalence of iron deficiency in primary hypothyroid was 34.2% [Figure 2]. It was higher among females 28.5% than males. Out of total 70 hypothyroid patients, patients who manifested with anemia were 20%, where as prevalence of iron deficiency was 34.2%, showing that frequency of iron deficiency (with or without anemia) is higher than iron deficiency anemia [Figure 3]. Anemia was defined arbitrarily with HB < 12gm/dl. Total number of patients who were iron deficient were 34.2%, in which 28.57% were females and 5.7% were males. Hypothyroidism is common, affecting 1% of general population and about 5% of individuals over age 60 years. Both hypothyroidism and hyperthyroidism are 5 or more times common in women than in men. Anemia in association with hypothyroidism has been studied since 1881. There are very limited number of studies investigating the relation of iron deficiency and thyroid hormones in humans. In fact, this study will be one of first few studies to determine prevalence of iron deficiency (with or without anemia) in primary hypothyroidism. Hypothyroidism can affect all organ systems; hematopoietic system is the primary one among these affected systems and anemia is the most important one. Anemia may occur even before any other manifestation of thyroid disease appears, at the same time or late in the course of hypothyroidism. Three major types of anemia are usually considered: Normochromic normocytic, macrocytic and hypochromic microcytic. Iron deficiency in general population could be because of so many reasons. Hypothyroidism is one of the causes of iron deficiency. The first stage in iron deficiency is negative iron balance, during this period, iron stores reflected by the serum ferritin level or the appearance of stainable iron on bone marrow aspirations decreases. As long as the serum iron remains within the normal range, hemoglobin synthesis is unaffected despite the dwindling iron stores. In hypothyroidism, iron deficiency anemia is usually ascribed to malabsorption of iron and menorrahagia. Thyroid hormones influence on hematopoiesis involves an increased production of erythropoietin or hematopoietic factors by non-erythroid cells. Anemia is diagnosed in 20–60% patients with hypothyroidism. Horton et al., report in there series 26%. In our study, only 14 patients (20%) manifested with anemia (which was defined as HB < 12 gm/dl), where as the prevalence of iron deficiency (with or without anemia) was 34.2%), in which 28.5% were females and 5.70% were males, thus showing that prevalence of iron deficiency (with or without anemia) can be higher than iron-deficiency anemia itself, which is supported by literature. A high rate of association between hypothyroid and anemia was found in Iranian population. Forty-three of seventy (64.5%) had concurrent anemia. The frequency microcytic iron deficiency anemia was found to be 14.3% in males and 85.7% in females. Iron deficiency has multiple adverse affects on thyroid metabolism. It decreases circulating thyroid hormone concentration likely through impairment of heme-dependent c peroxidase iodination of the thyroglobulin and coupling of the iodotyrosine residues, blunts thyrotropic response to thyrotropin-releasing hormone (TRH), decreases serum T3 and T4 and slow turnover of T3 and may reduce T3 binding. Studies have shown that plasma T4 and T3 levels in both basal conditions and after cold stress were lower in women with iron-deficiency anemia compared with the controls. As discussed, both iron deficiency and hypothyriod affect each other's metabolism. Also incipient iron deficiency may be present before it manifests as anemia. Thus simultaneous correction of both should be done earlier in order to achieve adequate response which may not be achieved if only one is corrected. The aim of this study was to find prevalence of incipient iron deficiency among primary hypothyroids, as early iron replacement along with levothyroxine in iron-deficient patients will provide desirable therapeutic response to levothyroxine as well as prevent ineffective iron therapy. Further studies are needed to highlight this topic. In our study, we found that the prevalence of iron-deficiency anemia in primary hypothyroid was 20%, where as prevalence of iron deficiency was 34.2% showing that frequency of iron deficiency (with or without anemia) is higher than iron deficiency anemia itself. To conclude, this study shows that prevalence of iron deficiency is seen in relatively higher frequency in primary hypothyroidism, which mandates measurement iron profile in primary hypothyroid patients. Simultaneous correction of both iron deficiency and hypothyroidism should be done as both affect each other's metabolism. It will be difficult to achieve euthyroidism or correct iron-deficiency anemia, if only one is corrected. Papadakis MA, McPhee SJ, Rabow MW. Current medical diagnosis & treatment 2013. New York: McGraw-Hill Medical, 2013. Melmed S, Polonsky KS, Larsen PR, Kronenberg H. Williams Textbook of Endocrinology: Expert Consult. London: Elsevier Health Sciences, 2011. Kreishman SH, Hennessey JV. Consistent reversible elevation of serum Creatinine levels in severe hypothyriodism. Arch Intern Med 1999;159:79-82. Antonijevic N, Nesovic M, Trbojević B, Milosević R. Anemia and hypothyriodism. Med Pregl 1999;52:136-40. Perlman JA, Sternthal PM. Effect of 131I on the anaemia of hyperthyroidism. J Chronic Dis 1983;36:405-12. Marqusee E, Mandel SJ. The blood in hypothyroidism. In: Braverman LE, Utiger RD, editors. Werner and Ingbar's the thyroid: A fundamental and clinical text. 8th ed. Philadelphia: Lippincott Williams and Wilkins; 2000. p. 800-2. Horton L, Coburn RJ, England JM, Himsworth RL. The haematology of hypothyroidism. Q J Med 1976;45:101-23. Malgor LA, Blanc CC, Klainer E, Irizar SE, Torales PR, Barrios L. Direct effects of thyroid hormones on bone marrow erythroid cells of rats. Blood 1975;45:671-9. Shakir KM, Turton D, Aprill BS, Drake AJ 3rd, Eisold JF. Anemia: A cause of intolerance to thyroxine sodium. Mayo Clin Proc 2000;75:189-92. Tunbridge WM, Caldwell G. The epidemiology of thyroid diseases. In: Braverman LE, Utiger RD, editors. Werner and Ingbar's The Thyroid. 6th ed. Philadelphia: J. B. Lippincott; 1991. p. 578-88. Dawson MA, Yarbo JW. Anemia in hypothyroidism. South Med J 1970;63:966-70. Nancy CA, Jhon PG, Rodgers GM. Wintrobe's Cinical hematology. 13th ed. Vol. 1. 2014. p. 810-5. Faucci AS, Kasper DL, Longo DL, Jameson JL, Huaser SL, Loscalzo J. HarrisonsPrinciple of Internal Medicine. 18th ed. Vol 1. 2011. Fandrey J, Pagel H, Frede S, Wolff M, Jelkmann W. Thyroid hormones enhance hypoxia-induced erythropoietin production in vitro. Exp Hematol 1994;22:272-77. Kazemi-Jahromi M, Shahriari-Ahmadi A, Samedanifard SH, Doostmohamadian S, Abdolahpoor E, Allameh SF. The Association Between Hypothyroidism and Anemia: a Clinical Study. IJHOSCR 2010;4:6-9. Beard JL, Brigham DE, Kelly SK, Green MH. Plasma thyroid hormone kinetics are altered in iron-deficient rats. J Nutr 1998;128:1401-8. Zimmermann MB. The influence of iron status on iodine utilization and thyroid function. Annu Rev Nutr 2006;26:367-89. Beard JL, Borel MJ, Derr J. Impaired thermoregulation and thyroid function in iron-deficiency anemia. Am J Clin Nutr 1990;52:813-9.